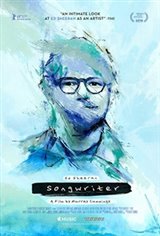 Songwriter is an intimate and personal look into the writing process of one of the world's leading artists - Ed Sheeran. Filmed by Murray, Songwriter details the creation of Ed's third studio album "Divide" and gives an authentic insight into Ed's life through never before seen home videos. Witness firsthand the creativity, from the very first chord to the finishing touch as the sounds become the songs.